There's no rebooting the Shaft legacy when you have such icons as Samuel L. Jackson and Richard Roundtree already part of the franchise. So Son of Shaft will be a true sequel that brings the entire Shaft family together, with Jessie Usher the newest member of this squad. Today, we have a first look at the three generations as they will appear in the upcoming crime thriller. This first look image arrives direct from acclaimed fashion designer Aleks Musika, who will be providing the stylish new wardrobe for his trio of classy men. 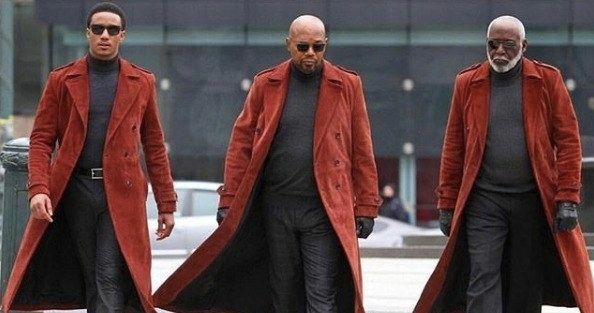 The trinity is seen walking in unison across a rooftop, with Jessie Usher leading the group in matching rust-colored trench coats, adorned with dark shades, and matching gray turtlenecks. The sight will surely bring a smile to any fan of the actors, and the Shaft franchise as a whole. Musika had this to say, quoting the iconic Shaft theme by Isaac Hayes. "YOU ARE DAAAMN RIGHT! This Was One of The Toughest Projects We Have Had to Do Yet, Shout Out to Our Whole&#[email protected] Team." Son of Shaft only just began shooting this February, with things kicking off on the 2nd of the month. Tim Story is directing the the sequel, which will arrive in theaters summer 2019. And sure enough, Isaac Hayes will be back to lend his talents to the soundtrack. The movie will continue the story of the 2000 reboot that brought Samuel L. Jackson into the Shaft family, with Richard Roundtree having introduced the original role of Detective John Shaft in the 70s with a number of movies and even a short-lived TV series on CBS. Samuel L. Jackson plays the nephew of John Shaft. This time, Usher will play Jackson's on-screen son. Though, he lacks the confidence and swagger of his namesakes, he is brought into a new case for his technology expertise, and learns to become smooth by association. This latest installment promises to be a straight up action flick, with some heavy drama sprinkled throughout, keeping it in line with the previous installments. It will mix the Millennial generation with the Baby Boomers for some interesting perspective on social culture at this time. And it's sure to rankle some as it explores the differences between these generations. You can see Samuel L. Jackson, Richard Roundtree and Jessie Usher walking in unison in this latest sneak peek that comes direct from Aleks Musika's Instagram. If nothing else, this movie is going to have style to spare, and it's certainly going to be one of the best looking movies of 2019.